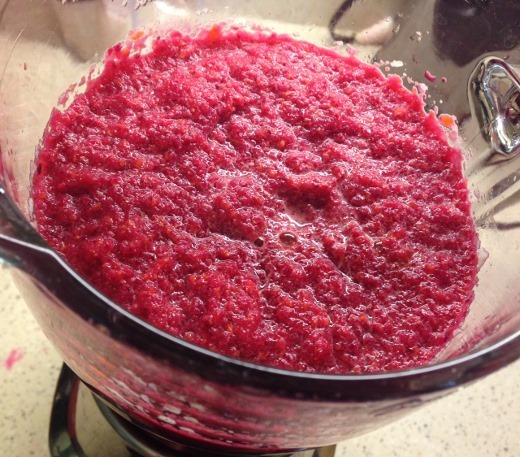 Did you know that you can make fresh fruit and veggie juice at home without a juicer? Well, you can! You just need two pieces of equipment. But first, let me tell you how I got here. Juicing has become very popular over the last few years. Up until recently, I really had yet to get into the craze. 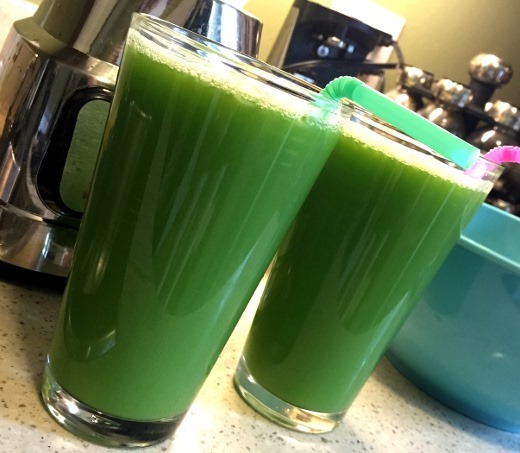 I watched the documentary Fat, Sick, and Nearly Dead on Netflix a couple years ago, but it never really inspired me to start juicing, as I already felt I was eating a relatively balanced diet. A few months ago, the folks at Garden of Flavor kindly hooked me up with a 1 Day Juice Cleanse and I had the opportunity to try drinking six bottles of their cold-pressed, certified organic juices in one day, and I really enjoyed them. Since then, I’ve been known to infrequently add a juice or two to my diet every few weeks or so, but again, never really got into a consistent juice-drinking habit. Over the past few months, I’ve given much praise to the Oh She Glows cookbook here on the blog. I have tried so many recipes from this vegan cookbook and loved every single one (especially the soups!). Perusing through the book, I found a couple of juice recipes and skimmed them over, with no real intention of trying them, initially. However, lo and behold, I discovered a gem of a tip for making juice sans juicer. It doesn’t matter who I am talking to – every single person that I’ve mentioned my nut milk bag to cannot keep a straight face. Haha. I know. It’s a weird name. The primary purpose of a nut milk bag is to make, you guessed it, nut milk – such as almond milk or cashew milk. But it can also be used for juicing. These bags are very affordable (mine was less than $7), take up little space in your kitchen, and can be easily found on Amazon. This is the one I purchased and have now used several times. Yes, so THANK YOU VERY MUCH to the Oh She Glows cookbook for this amazing tip! I was so inspired by the idea of making juice with a blender, that I immediately hopped on Amazon and ordered this nut milk bag. The day it arrived, I went produce shopping. Since then, I’ve tried making several juice concoctions, all with great success. Making the juice is quite easy, but requires a little bit of prep. The veggies need to be washed and chopped into chunks of a size that are suitable for your blender. My tip is to add the veggies with the highest water content to the blender first (i.e., the softest ones). 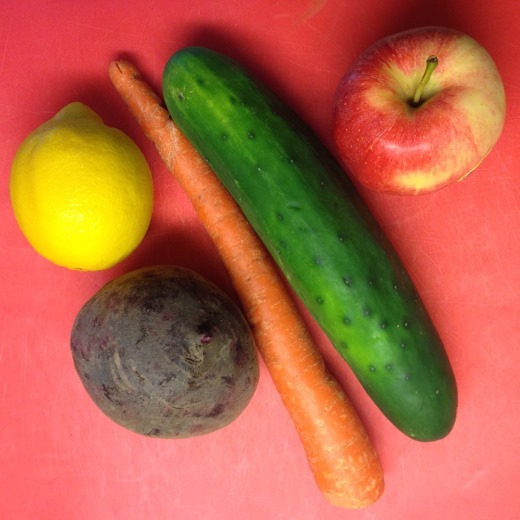 I peeled the cucumber and the beet, but did not bother peeling the apple or the carrot. Next add enough water to cover the blades at the bottom of the blender – about a half cup. Next, cover, and blend away until smooth! If you’re having trouble getting the mixture to blend, you can always add a little more water, too. The remaining pulp can be composted or added to baked goods. You could even stir a portion into the juice for more fiber, if desired. I was left with this beet-utiful red juice! I absolutely loved it too. I’ve grown fond of the mildly sweet, earthy flavor of beets over the past couple of years, and the flavor pairs well with sweet carrots and apples. I do have one safety tip for you though. I HIGHLY recommend drinking your fresh juice immediately. I saved half of this juice and drank it the next day, and after sitting in my fridge overnight, it did NOT agree with my gastrointestinal tract. I have various theories as to why this happened, but in the future I think I will simply avoid saving extra juice, and just make enough for my immediate consumption for food safety purposes. Also, the longer the juice sits, the more the vitamins oxidize, so it is to your advantage to drink it as soon as possible, nutritionally speaking. I’ve made a few other juices too! Want to see? 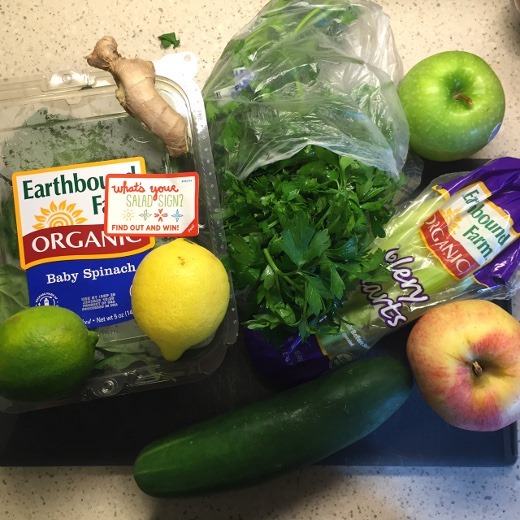 I made this green juice after I flew home from Washington DC last week with the intent of flooding my system with nutrients after being exposed to germy airplane air. 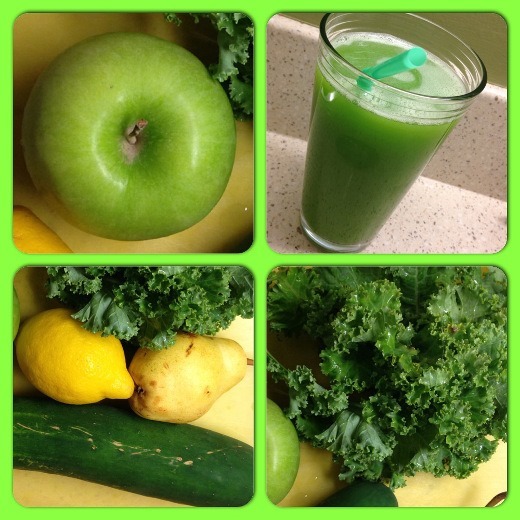 A more complex green juice, with spinach, apples, citrus, ginger, parsley, celery, and cucumber. 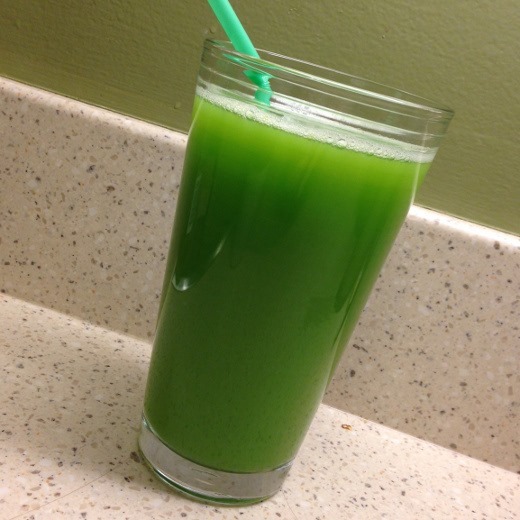 I used this recipe to make this vibrantly green juice. The ginger is very strong – take it easy on the ginger! One for me, and one for the huz. 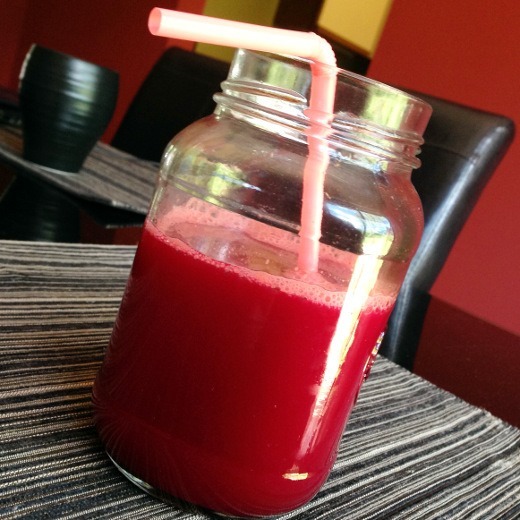 My favorite of the four recipes I’ve tried so far is most definitely the beet concoction. Which is strange – I used to despise beets, but have grown very fond of them as I’ve gotten older. Give ‘em a chance! 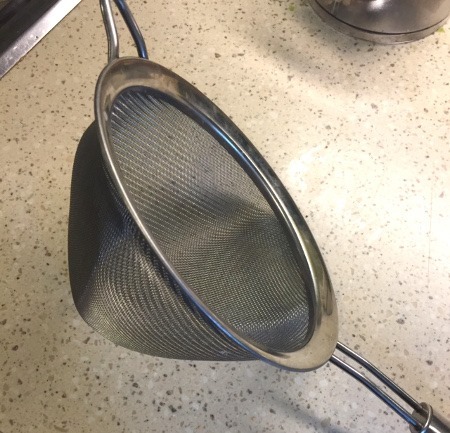 From what I understand, a fine sieve, such as this ones, could also be used for juicing without a juicer. I know a lot of people are skeptical of juicing for various reasons, perhaps most often for the reason that juicing removes the vast majority of fiber from the fruits and vegetables that are consumed. For me personally, this is not a huge concern, as I am primarily supplementing my diet with fresh juices, rather than replacing foods. 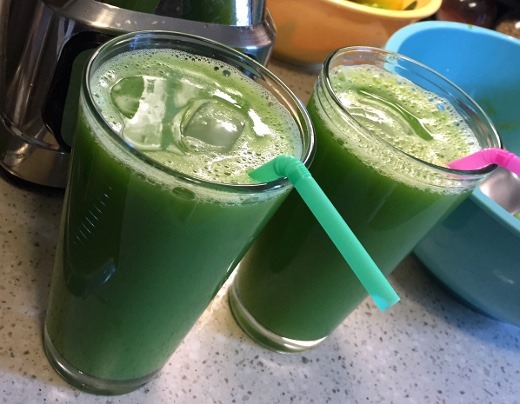 I’m not here to discuss the merits of making smoothies versus juicing versus consuming the whole vegetable, but instead wanted to shed some light on a new, easily approachable method for those interested making juice at home. 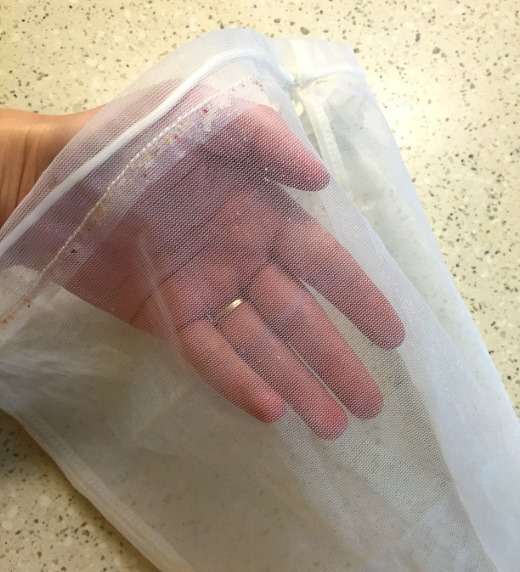 I think this blender + nut milk bag method is a fantastic option for those are are interested in trying juicing without investing in an expensive and bulky juicer. I am mindful of the fact that calories in fresh juice can add up quickly, especially when fruits with lots of sugar are used, and will probably focus on incorporating mostly vegetables into my juices for this reason. Additionally, I do make an effort to buy organic produce for my juicing, when affordable and available, especially when purchasing items falling into the Dirty Dozen. Moving forward, I see myself adding fresh homemade juice to my diet occasionally, perhaps to supplement or, on rarer occasions, to replace a meal. I think this is a great method for supplementing my diet with additional nutrition, as well as for hydrating. Also, I really enjoy the flavor of the juices! They are delicious. 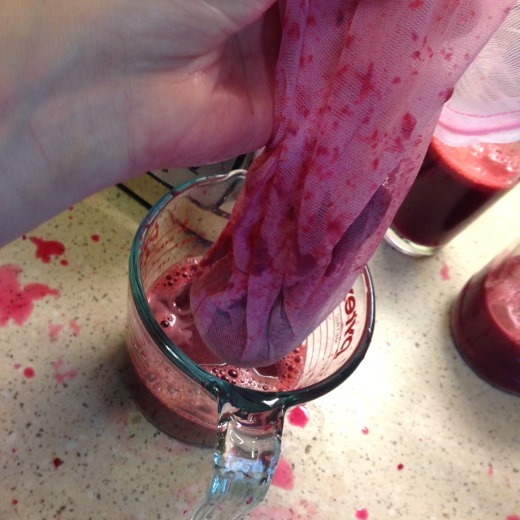 Have you ever tried juicing? 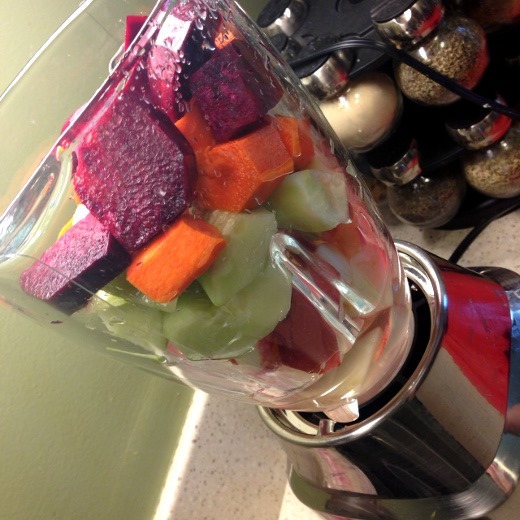 What is your favorite blend of fruits and veggies? Great question! I’ve wondered the same and unfortunately am not too sure! I have managed to get some very colorful juices with a lush texture, but who knows if that is correlated with nutrition. They are very delicious though!